Spectacular finish to second race at the Norisring season highlight as Edoardo Mortara (SILBERPFEIL Energy Mercedes-AMG Motorsport) and Daniel Juncadella (Mercedes-AMG Motorsport REMUS) both take podiums for the Mercedes-AMG Motorsport DTM Team. Edoardo secured his second podium finish of the weekend in a race that was hard-fought from the very start to the chequered flag. 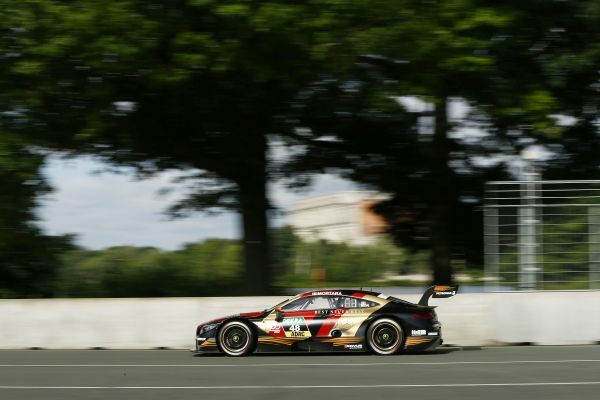 He took the win on Saturday and then went out today to notch up his fourth podium finish at the Norisring and the 25th of his DTM career to date. His team-mate Daniel Juncadella was delighted earlier this morning when he secured his maiden pole position in the DTM in the second qualifying session, racking up Mercedes-AMG’s 20th pole position at Nuremberg’s street circuit and the 132nd of the brand's 30-year history in the DTM. He led the race for a while after that and booked his maiden podium in the touring car series in his 64th DTM race. The brand with the three-pointed star produced a strong team showing as they had done in the first race on Saturday with five drivers bringing their Mercedes-AMG C 63 DTMs home to a points-scoring finish in both races. Apart from Edoardo and Daniel, Lucas Auer (SILBERPFEIL Energy Mercedes-AMG Motorsport), Paul Di Resta (Mercedes-AMG Motorsport REMUS) and Pascal Wehrlein (Mercedes-AMG Motorsport PETRONAS) also took points on Sunday, taking the chequered flag in fifth, sixth and ninth position respectively. Pascal moved nine places up the field during the 68-lap race. Gary Paffett (Mercedes-AMG Motorsport PETRONAS) finished the eighth round of the season in 13th place following a tough race with plenty of scraps and with 99 points, still leads the drivers' standings. Edoardo Mortara (93 points), who is six points behind Gary, is now second in the standings. Two more Mercedes-AMG Motorsport DTM drivers – Paul Di Resta (fifth) and Lucas Auer (sixth) – are in the championship Top Six. Team SILBERPFEIL Energy Mercedes-AMG Motorsport on 165 points lead the DTM team classification by 20 points. Mercedes-AMG (421 points) are in first place in the Constructors' Championship, 108 points up on BMW (313 points). The next race weekend: Zandvoort’s legendary dune circuit will this year be the venue for the race meeting that marks the half-way stage in the 2018 DTM season. Drivers will contest Race 9 and 10 there, July 13th - 15th. “Incredible! First the victory yesterday and now the P2 today. It’s brilliant. Especially after such an extremely thrilling race. I started from P5 and did my pit stop after the first lap. It was certainly difficult with the tyres, but the car was much better today and everything went well. But it is still too early to think about the championship. “I am definitely satisfied with the way today went. I finally got my first pole position, and of all weekends, it was at the Norisring, one of the highlights of the year. After so many years, it was a great feeling. My car was incredibly strong today, so I have to thank my entire team. On this track, anything can happen in the race. “Things went really well for me after the start and I was in second place, so I don’t think that P5 in the end is a satisfactory result. On the other hand, every point is important. It’s better to have the points for fifth place rather than nothing. We must now carefully analyse the weekend’s data. “It was all a bit up and down today. We didn’t get everything out of the situation with our P6 today, but I’m not a big fan of this track. Consequently, it’s good to see that we held our own in the championship.